'Castlegould', originally the Howard Gould estate designed by Hunt & Hunt c. 1909 in Sands Point and later owned by Daniel Guggenheim and given the name 'Hempstead House'. Click HERE and HERE for more on the estate. Click HERE to see the estate on google earth and HERE on bing. "Darling, let's build a house at Sands Point. Let's make it as large, grim, and forbidding as our fortune will allow. Everyone will be in awe of our wealth, even as they shudder at the sight." The older I get, the less grandeur for grandeur's sake moves me. That said, from my perch up here in Maine, the Nassau County parks system just perplexes me. Although up here in Maine, the current controversy is the privatization of an 1840's fort from State Park system management, so, glass houses and stones. Wretching an historic home's control away from any county, state or federal government is usually a winning proposition but especially when one is discussing Nassau County. (i.e. Coe Hall's revival). That being said, I think this is a great looking castlellated structure on a high bluff with amazing views. Aside from the loss of the spectacular glass screens enclosing the palm court, the interiors are fairly intact. Plus any home that revolves around a light filled palm court is never going to have a bad layout of rooms. The extensive master suite of bedrooms, sitting rooms and connecting baths, is also one of the best. The sun room over the porte-cochere is also a wonderful setting. The extensive service wing includes a servant dining and living room and the butlers suite of rooms is quite accomodating. The current state of the structure is absymal at best thanks entirely to Nassau County and the abundance of incompetent, ignorant and inept public officials who inhabit the town payrolls. Sad that one of the wealthiest counties in the US can't manage to maintain their public properties and historic buildings. (See Old Bethpage Restoration, Welwyn, Woodbury House, Chelsea, Muttontown Meadows, Cedarmere to name a few glowing examples of public neglect, waste and mismanagement). If not for volunteers and private support most properties would look even worse. Zach, thanks for floor plans. 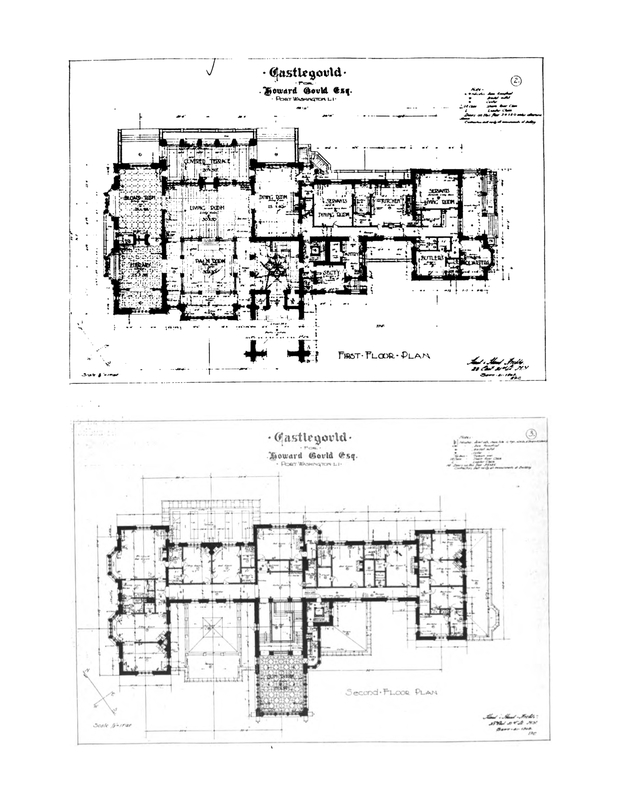 Even without knowing how dark & heavy ‘Castlegould / Hempstead House’ is I wouldn’t think much of the floor plans. As I’ve said before, Hunt & Hunt inherited his father’s name but not his talent. • The public rooms layout makes me the think “hotel” rather than “residence,” but that could be just me. • I like the secretary’s office right off the entry hall & it having its own, separate entrance. 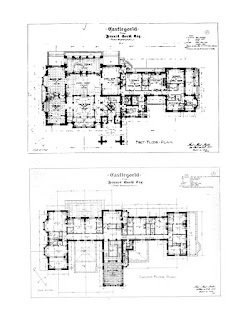 • The way I read this plan food went from the kitchen, across the hall into the butler’s pantry, & then back out into the hall to be taken into the dining room – this cannot be right. • The servant’s quarters appear roomy & there are adequate bathrooms. • The sun room is nice (nicer if it had been facing the water) & I like the separate service access; but there should have been a half bath created for this room along that service hall. • The servants’ stairs are fine one the ground floor but on the second floor they leave servants having to step out into the main hall, which runs the length of the house, to get anywhere on the second floor, including the [I'm guessing upper] servants’ bedrooms on the second floor. • The master & guest rooms are nice with generous closets & a bathroom attached to each. Are there no main stairs to the third floor, only servants’? There, my two cents … worth every penny. I thought I read here somewhere that the steel beams supporting this building are shot and need replacing....if that's the case, this building is a goner. Nassau would never foot the bill for that. Anon I would bet otherwise. Nassau County will get around to it, maybe not in my lifetime, but eventually. The county has not fixed what was a water infiltration problem over the last 20 plus years. As a result, today there is severe structural damage to the steel and the masonry walls at the north-east corner and along the entire north wall. Nassau County doesnt understand the concept of preventative maintenance, let alone maintenance in general. Nassau officially waits long enough until the routine 500k project becomes a major 25 million dollar plus project and then complains they dont have the money to address the problem. It is very very rare to be this incompetent and foolish or precisely just plain stupid, almost an art form really. One of my personal faves; although the sun-room doesn't face the water (north), it is nonetheless a spectacular space, and with the windows open, a quiet breeze blowing the sheers that were then on the windows, it was a space out of time. The interiors always surprised me; despite being hulking & monolithic on the outside, the interiors are pleasantly quiet and, dare I say it, even comfortably domestic. Much of the sad state of affairs seems to be at the hands of a lot of back room machinations with the way the county has partnered with the Friend of Sands Point Preserve, which is unfortunate. Nassau County is broke. They haven't fixed anything because they are the problem. What's a roof leak when the county is in the dumper? Didin't they close 2 Nassau Police precincts this year? 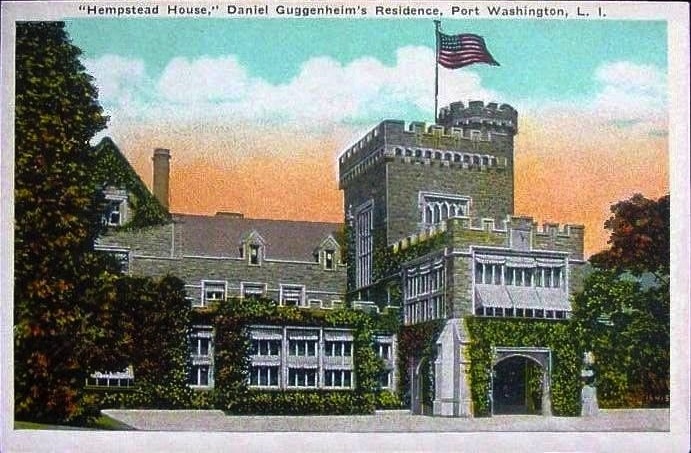 Fixing Hempstead House is not high on their list of priorities (and in all likelihood not even on the list to begin with). I know I have mentioned it before...but the NC Employee's Union prevents anyone from being able to donate work to help any of the deteriorating county owned properties. We could all get together tomorrow and buy paint and roof shingles and tell the county we are going to show up at Chelsea to do work and we would be stopped. The problem is very large and very complex unfortunately...and the ridiculous thing is it doesn't need to be. I'll tag one comment onto Zach's --because of course, Nassau County government, like most any government, always maintains its abilty to stop taxpayers / residents from interfering with government operations (even with two fewer police precincts); I believe it's called "empire building" (which they build & maintain well).